Innovative Accessory 7500-1000-232 7500-Deluxe Flat 27inch panal Radial Arm with Internal Cable. Includes FLEXmount with 6 mounting options, 18" of vertical range, 27" of horizontal range. Folds up to occupy just 3 of space, Monitor tilter mechanism can tilt over 200 degrees. 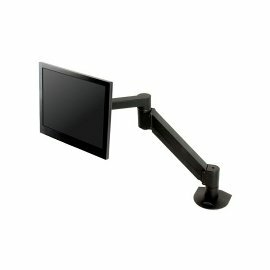 Monitors are rendered weightless by the arm, Select from numerous mounting options. Cable management keeps cables tucked beneath arm, Approved to AFRDI Standard 126: 2001, Level 3.